Do You Want An Oil & Gas Czar in Texas? If the Answer is NO, Call Your State Rep! Over and Over again we conservatives have railed against President Obama and the number of unconstitutional czars he has in his administration. So I am left to assume the answer to the question before mentioned in the title would be No! Any true liberty minded, quote conservative close quote, would not actually make a power grab and push for such a thing here in Texas? Well, according to the Texas Energy Report, that is exactly what Commissioner Smitherman of the Railroad Commission of Texas (RRC) has done. It’s been reported that Commissioner Smitherman, behind the backs of his fellow commissioners, is pushing an amendment to Representative Bunnon’s sunset bill; HB 2166. This amendment would give the RRC Chair, powers not shared by the other two commissioners. He wants the Chair to act as the primary and only contact for agency, wield greater administrative and strategic influence over the Railroad Commission’s business. I believe this is a power grab and will in essence demote the other two commissioners to figure-heads. I applaud Commissioners Porter & Craddick for not supporting this travesty of liberty. We don’t need czars on the federal level and especially not at the RRC, which is the largest oil & gas regulatory agency second only to the federal Department of Energy. Just imagine the corruption and pay for play environment that will be fostered. 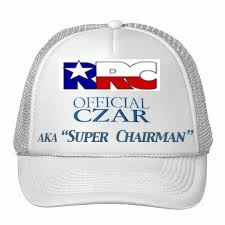 No CZARS in Texas! All Tea Party and liberty minded patriots should call the members (numbers provided) of the Texas House Committee on Energy Resources, to let them know you do not support an oil & gas czar in Texas. Chair – Rep. Jim Keffer (512) 463-0656, Vice Chair – Rep. Myra Crownover (512)463-0582, Rep.Lon Burnam (512) 463-0740, Rep. Terry Canales (512) 463-0426, Rep. Tom Craddick (512)463-0500,Rep. Tony Dale (512) 463-0696, Rep. Phil King (512) 463-0738, Rep. J. M. Lozano (512)463-0463,Rep. Chris Paddie (512) 463-0556, Rep. Ralph Sheffield (512) 463-0630. Contact Commissioner Porter (512) 463-7131, & Commissioner Craddick, (512) 463-7140, to show your support. Further call Commissioner Smitherman’s office, (512)463-7144, and let him know your disgust that he would attack our liberty,again, in this way! Honorable Gregory Parker, Ph.D.(ABD), M.P.A. This entry was posted in Energy Policy, Texas. Bookmark the permalink.